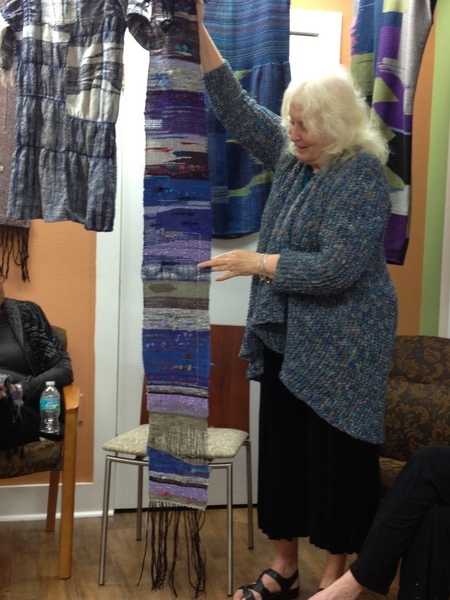 SAORI Weaver SRQ is a new studio in Sarasota, FL. 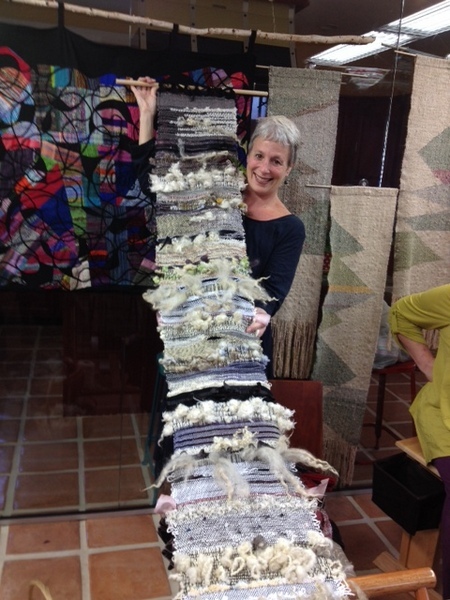 It opened last November by Kathleen Keenan who has been a traditional weaver and got trained at my studio. She used to teach at Artist Guild in Falmouth, MA and moved down to FL last year. She set up 5 intensive workshop and a day with my presentation followed by SAORI kai. It was amazing 6 days. 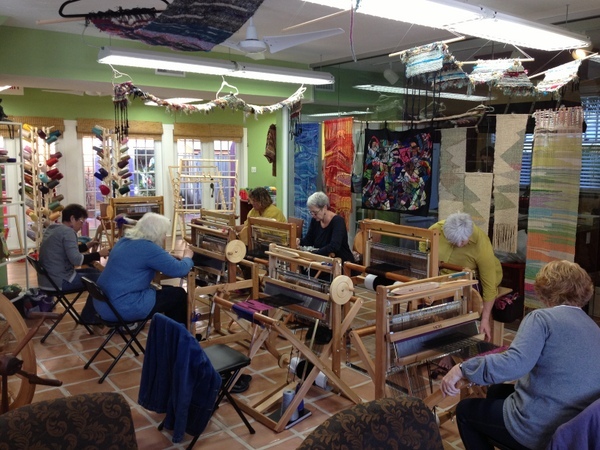 2 full day weaving with pre-set warp, a cloth making construction workshop followed by a visit Ringling Museum, a full day of cloth making and a dying workshop. 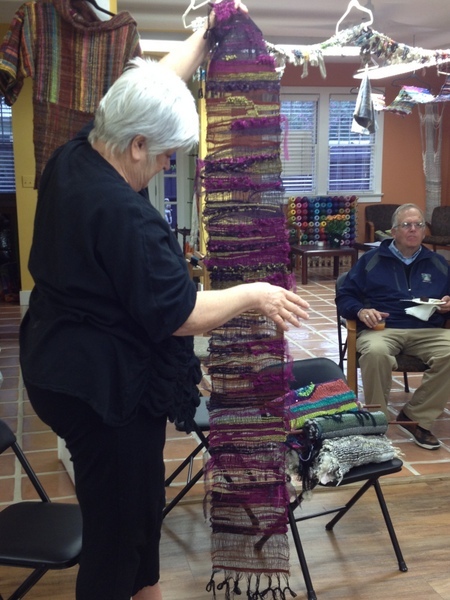 First of all, because Kathleen and all 7 attendees were wonderful, all the workshop went very well. 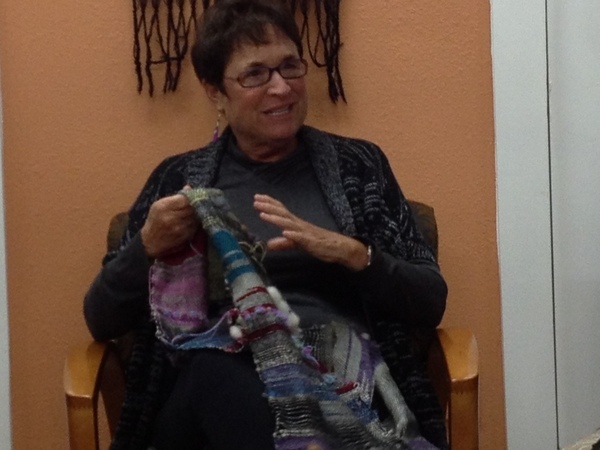 They were very open minded people who had art/weaving backgrounds and/or teaching experiences. 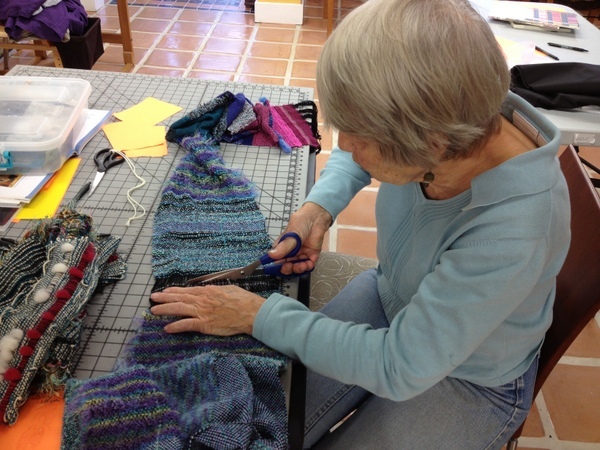 Some of them were fiber artists and most of them knew each other which made this intensive learning possible. 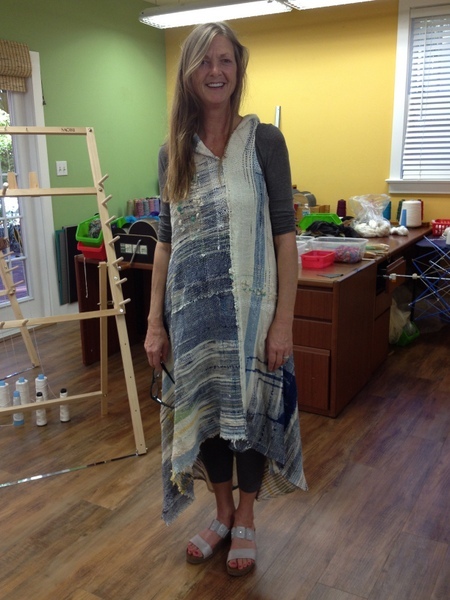 The clothing workshop was the most challenging day. There were many dramas. Some could not figure out what they would like to make out of the pieces, some realized the initial plan would not work and some got stuck in the middle of creating. It was great to have each other to encourage and suggest new possibilities. Some completed the projects and some didn’t. However, at the end everyone smiled. At least everyone had plans that they knew they could finish it up. 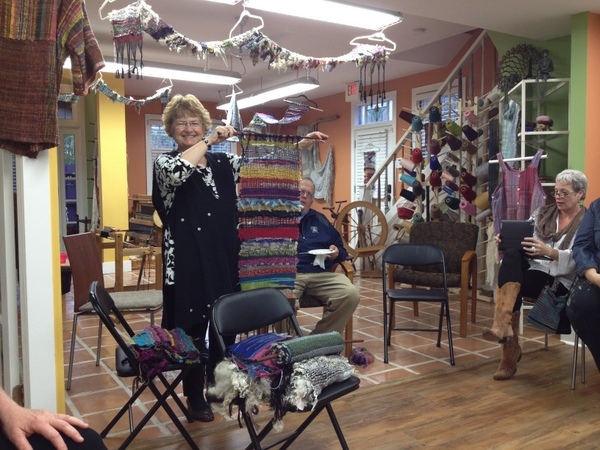 I enjoyed a dying workshop because Betsy introduced fascinating dye called Color Hue. I told how to tie-dye SAORI way at first. 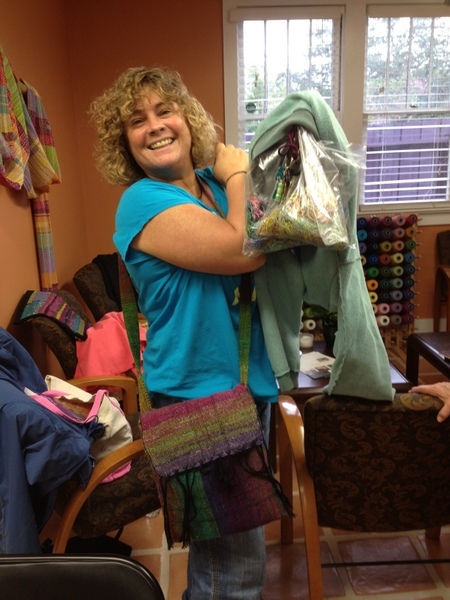 And we put dye in a clear plastic bag, put yarn without washing (we dyed silk warp) and squeeze the bag to let yarn absorb dye color. Untie the plastic cords and add new color to white parts. I kept experimenting with this dye at home now hoping to share this at my studio soon. Thank you, Kathleen for your generous hospitality. 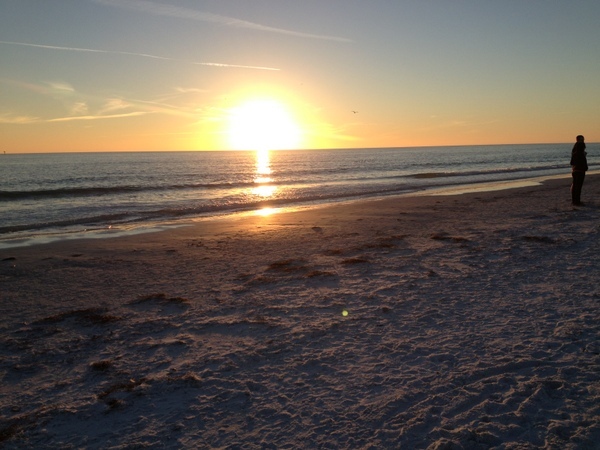 Of course the sunset at Siesta Bay Beach was one memorable scene on this trip! Mihoko, It was wonderful to have you here for our workshop. I was honored to learn from you. Please come back to see us! Sounds like an amazing time – what a way to open a studio!! What a wonderful way to spend a wintery week in sunny, Florida! The inspiration and sunset weaves a wonderful story. How did I miss you wonderful writeup of an amazing experience? Thank you Mihoko, for being a playful and flexible spirit. 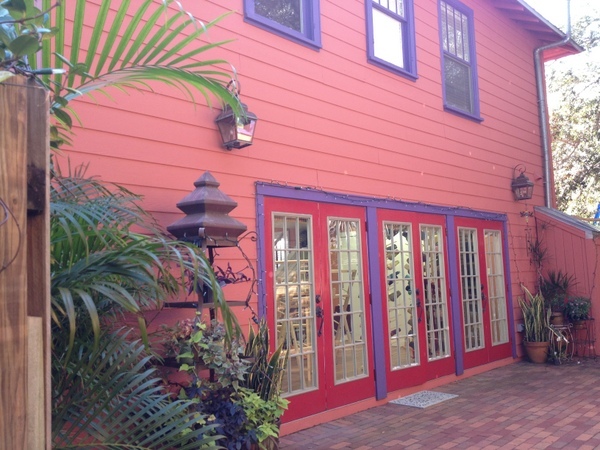 We miss you here in Sarasota….Next season we will do a repeat!